I know its been quite a while since my last post (*ahem* 4 1/2 months). Life has been busy! But that's not why you're here... on to the layout! Paper Issues has a new linky party started and it titled "Say it ain't snow cold outside" and I have a layout about my pup that is perfect for this theme! My dog, Chewie does not like the cold so he was a little ticked off at me for keeping him out in the snow for a photo. giggle. If you've got a snow/winter/cold themed project to share with us, hop on over to the Paper Issues blog and link us up! 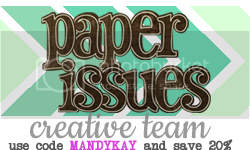 And if you're in need of some craft supplies, hit up the Paper Issues store and use my code: MANDYKAY to save yourself 20%! I love this layout and your pup!